Two prominent African-American women were among the speakers at a memorial service in Milwaukee on Saturday for former Wisconsin Secretary of State Vel Phillips. Phillips died last month at age 95. U.S. Rep. Gwen Moore, D-Milwaukee, and Milwaukee County Chief Judge Maxine White delivered extended remarks in a two-hour ceremony at St. Mark AME Church. Moore, White and other speakers brought the audience to laughter and tears. Phillips is the only African-American ever elected to statewide office in Wisconsin, serving from 1979 to 1983. 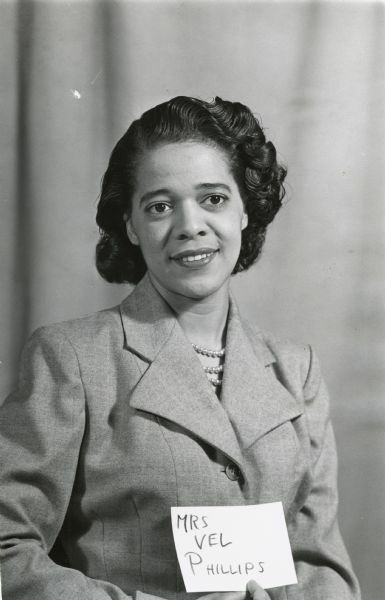 She was also the first black female judge in the state, the first African-American woman to graduate from the University of Wisconsin Law School and the first black woman to serve on the Milwaukee Common Council. One highlight of Phillips' time on the council was spearheading an open housing ordinance that passed in 1968. Moore said the measure helped reduce decades of housing segregation. "She won, and not only did she win here locally, where they called Milwaukee 'The Selma of the North,' but she spearheaded the initiative to change this on the national level, the federal level with open housing legislation that spread across the country," Moore said, to applause. Moore said Phillips didn't like to talk about her firsts. "'All that means is I'm old, and I've been around to break down these barriers before anyone else got here,'" Moore quoted Phillips as saying. But Moore went on to discuss some less commonly known firsts, such as Phillips being the first African-American woman for whom they named ice cream. "I mean, wouldn't we want to talk about that, Vel?" Moore said, to laughter, saying a Milwaukee restaurant had come up with a flavor honoring Phillips. Moore also noted Phillips was the first woman at city hall to wear a pantsuit. "Vel broke through for those people who wanted to wear pantsuits," she said. White called Phillips "a change agent" who always had sense of urgency. "Nothing was ever small," White said. "Even nearing her sunset, in the weeks before her passing, I sat and listened, and she expressed thoughts and excitement about some bad news of the day. I know that she asked a lot of you, 'Do you have the phone number for (former Gov.) Tommy Thompson and (Gov.) Scott Walker with you, right now?'" White said. Phillips' son, Michael Phillips, also spoke. He described his mother's love for the Green Bay Packers, saying it began when his father and Vel's husband, the late Dale Phillips, admired a Packers policy started under coach Vince Lombardi that emphasized racial equality. "They had that policy when the Packers went on the road, that if a motel would not house all of the Packers, then they would not house any of the Packers," Michael Phillips said. Michael Phillips also told the audience his mother admired basketball star LeBron James, loved ice cream and loved to laugh. The younger Phillips said he and his mother, a lifelong Democrat, would laugh at the oddities of human existence. "We laughed at how a man with a bad comb-over and orange skin could become president," said Michael Phillips, referring to President Donald Trump. Many in the church laughed. "God bless her," Michael Phillips said, his voice wavering.